1. Eames Lounge, realeased in 1956. 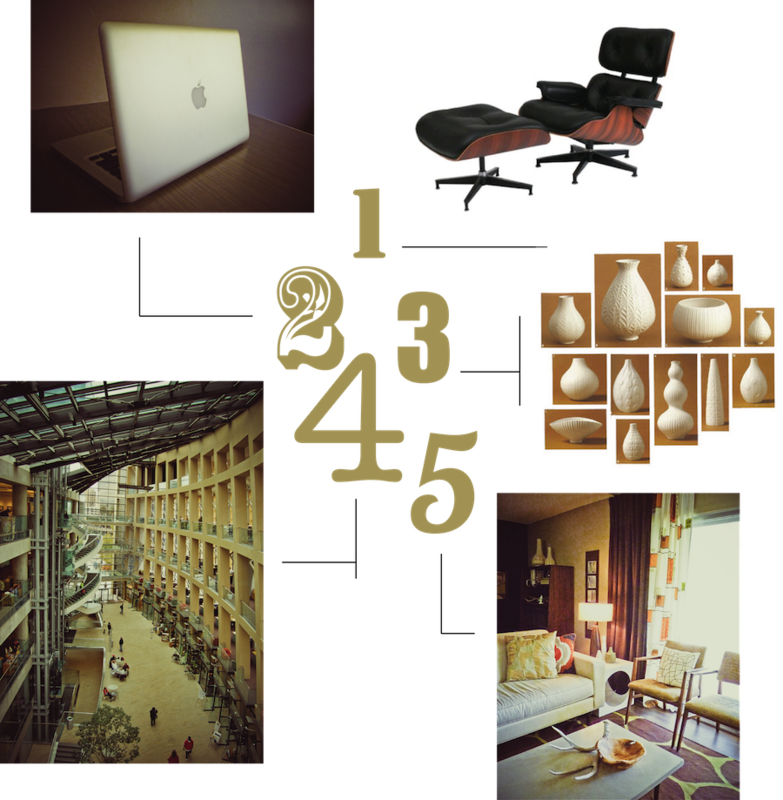 Designed by Charles and Ray Eames for the Herman Miller Furniture Company. I will have one of these someday. 2. Macbook Pro, by Apple. I do have one of these, and I couldn't ask for a more sleek and modern design. Even better, it does pretty amazing computer-y things as well. Win, win. 3. Jonathan Adler Pottery. Jonathan Adler is one of my favorite designers. He's known best for his pottery, and his mix of modern forms, bold colors and prints. 4. Salt Lake City Public Library. Local win! Designed by Moshe Safdie in 2003, this is one of our city's architectural gems. It's different from every angle and rich with hidden surprises. 360 views of the valley from the roof, to boot. It's where I head when I want to be inspired. 5. Mi Casa. Your own space should be one of your favorite things. I'm a sucker for bold patterns and prints (see no. 3; thank you, Jonathan Adler), and I looove combining the two. Precisely why my space makes me happy.